This charming Wichtel doll is made by Schildkrot and is new for 2018. Her name is Lili and her face mould is Lulu. Schildkrot describes Lili's eyes as 'topas'. We interpret this as a deep golden brown colour. Lili's entire face and body mould is sculpted by German doll artist Rosemarie Muller and made at the Schildkrot factory in Rauenstein, Germany. The dolls are named "Wichtel" dolls which translates to "elves" - 'balm for the soul' is how they are often referred. The vinyl is completely hard phthalate free vinyl. There are 5 fully articulated joints. 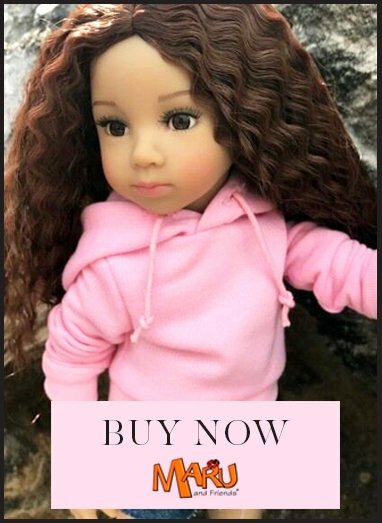 The hair is a hand knotted human hair wig. The eyes are hand-blown glass eyes from Lauscha (the very best eyes!) and the face is lovingly painted by hand. Lili's hair is brown coloured wig, styled into cute plaits, and her eyes are topas.